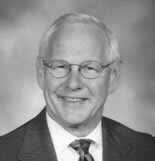 Bill Campbell earned a bachelor of science in pharmacy (1965) and a master of science (1968) from Oregon State University. After completing his Ph.D. at Purdue University (1971) he returned to OSU as assistant professor in the School of Pharmacy. Bill became department chair of Pharmacy Practice at University of Washington in 1976, and went on to be the dean of the School of Pharmacy at Auburn University in 1988. Bill accepted the deanship at University of North Carolina School of Pharmacy in 1992. He is currently adjunct professor of Pharmaceutical Outcomes and Policy, and dean-emeritus of the School of Pharmacy. He is a former president of the American Association of Colleges of Pharmacy and former member of the board of trustees of the United States Pharmacopeia. His wife, Karen, is an OSU pharmacy graduate who practices at Piedmont Health Clinic in Chapel Hill, NC. Bill and Karen have two children, a daughter (Kelly) and son (Scott), and will celebrate their 40th wedding anniversary this year. Chuck earned a bachelor of science in pharmacy (1963) from Oregon State University and went on to attend the Kellogg Business School. He was an entrepreneur from the start. Chuck purchased his first pharmacy in 1964, just a year after he graduated from OSU. Chuck went on to establish a Long Term Care Pharmacy and Konva Care Medical supply company. He also worked with the Associated Home Health Care Agency and Partners in Pharmacy. He has gone on to represent pharmacy at President Clinton’s Pacific Rim Conference and has worked with the DEA, in Washington, D.C., to establish new rules for long-term care patients. He has served as president of the American Society of Consulting Pharmacy (ASCP), President of Kiwanis, and president of Toastmasters. Chuck has been a member of numerous associations including APhA, OSCP, and JCPP. Today, Chuck is enjoying the retired life along with his wife of 47 years, Eileen. They have five children; Mike, Kim, Kathy, Kristi and Matt. All together they have 15 grandchildren to spoil. Currently, he serves on the board of directors for MBank of Gresham, Ore.
Flynn received his bachelor of science in pharmacy from Oregon State College (now OSU) in 1943. After graduation, Peyton Hawes — founder of Pay Less — immediately hired him to work as a pharmacist in the wartime community of Vanport, Ore. In 1944, Flynn entered the Navy as a pharmacist and worked in the Navy hospitals in Camp Adair near Corvallis and Camp White near Medford. After the war, he went back to Vanport for about a year and then began managing a store in east Portland. In 1947, he moved to Klamath Falls to manage a drugstore that would become Pay Less a few years later. Flynn was vice president and member of the board of directors at Pay Less when the company went public on Oct. 31, 1967. He continued to manage the store in Klamath Falls until 1972, then moved to work out of the Portland office, focusing all his energies on pharmacy administration. Pay Less sold their stores to K-Mart in the mid-1980s, then K-Mart sold to Thrifty Drug. Flynn retired in 1989 before the Thrifty buyout. Eventually the stores were sold to Rite Aid, making them part of a conglomerate of 2,000 stores. However, the Pay Less name was never sold and today it is used by an organization with a different, related business plan. Noel and his wife Cornelia have been married for 63 years. They have two sons, Jim and Richard. They enjoy spending time with their three grandchildren and two great-grandchildren.